If you are having trouble viewing the interactive Google map above please try switching your browser to Chrome. We are at Site U1526 right on top of the Tūranganui Knoll. This is a seamount that rises almost 900 m above the seafloor – from a depth of 3600m to 2740m. It is sitting on the margin of the Hikurangi Plateau approximately 110km east south-east of Gisborne. A seamount is an underwater mountain formed by volcanic activity. Seamounts were once considered to be little more than hazards to submarine navigation. Today, scientists recognize these structures as fascinating biological ecosystems and geological hotspots. New estimates suggest that, taken together, seamounts encompass about 28.8 million square kilometres of the Earth’s surface. That’s larger than deserts, tundra, or any other single land-based global habitat on the planet. 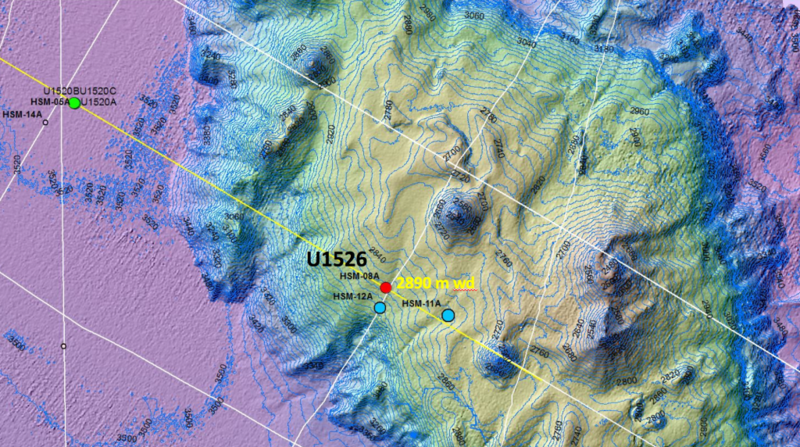 We were close to this seamount a few weeks ago to collect core from the seafloor near its western flank. Now, we aim to sample and describe the age, physical characteristics and properties of the top portion. 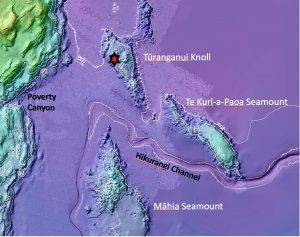 We believe that other seamounts in the Hikurangi subduction zone have already been subducted and some hypotheses are that they may affect slow slip events, or perhaps trigger earthquakes as they are harder to subduct under the Australian plate (see our previous blog). Is there a sedimentary cover at the top, and if so how thick is it? What types of igneous rocks make up the top portion of the seamount? How will the overlying sediments and underlying igneous rock behave when they are incorporated into the subduction zone and decollement? We are concerned with understanding the ‘before and after’ process. We need to quantify and test this seamount material before it is subducted, to understand what might happen to it afterwards. Seamounts might cause added friction as they are dragged under the Australian plate (‘subducted’), or break apart in unusual ways, so we can simulate these pressure and temperature effects in the lab on this pre-subducted volcanic basement material. Seismic profile of the knoll with our borehole marked as a red line.